To Cite: Molaee S, Ghanaati H, Safavi E, Foroumandi M, Peiman S. Computed Tomography Pulmonary Angiography for Evaluation of Patients With Suspected Pulmonary Embolism: Use or Overuse, Iran J Radiol. 2015 ; 12(3):e22383. doi: 10.5812/iranjradiol.12(2)2015.22383. Background: The use of computed tomography pulmonary angiography (CTPA) has been increased during the last decade. Objectives: We studied the adherence to current diagnostic recommendations for evaluation of pulmonary embolism in a teaching hospital of Tehran University of Medical Sciences. Patients and Methods: The registered medical records (Wells scores and serum D-dimer level) of all patients whose CTPA was performed with suspicion of pulmonary thromboembolism (PTE) were studied retrospectively. Modified Wells score of each patient was determined without being aware of the CTPA results. The patients were categorized to those with a high (likely) clinical probability (score > 4) and low (unlikely) clinical probability (score≤ 4) of PTE. Results: During a 6-month period, 82 patients who underwent CTPA were included. The prevalence of PTE was 62.2% in the group of subjects with a likely clinical risk. In 45 (54.8%) of those patients whose CTPA was requested, the PTE was unlikely based on modified Wells criteria. In the clinically unlikely group, serum D-dimer assay was done in 15 out of 45 (33.3%), while it was inappropriately checked in 10 out of 37 (27.0%) with a clinically likely risk. General adherence rate to diagnostic algorithm of PTE was 43.9%. Conclusion: There is still excessive unjustified concern of PTE in less trained physicians leading to excessive diagnostic work-up. Loyalty to the existing guideline for management of suspected PTE in educational hospitals and supervision of attending physicians could prevent overuse of CTPA. Diagnostic approach to patients suspected for pulmonary thromboembolism (PTE) as a significant health problem in practice is still challenging. Both over- and underdiagnosis could result in significant morbidity and mortality. The combination of clinical probability estimation, CT pulmonary angiography (CTPA) (Figure 1) and serum D-dimer level is usually used to establish the diagnosis. Wells score and its simplified version have been accepted as the most cited clinical criteria that have categorized PTE probability to likely and unlikely clinical risk groups (1). Considering the high sensitivity and specificity of CTPA, it is now assumed as the diagnostic imaging modality of choice for acute PTE diagnosis. However, more availability of this modality raises an emerging concern of its overuse. Figure 1. Axial view of computed tomography pulmonary angiography in a patient in the likely risk group showing filling defect in both main pulmonary artery branches compatible with bilateral pulmonary thromboembolism. This study was performed in a referral educational hospital to determine adherence rate to existing diagnostic algorithm for patients who underwent CTPA with suspected PTE. From September 2013 to March 2014, we retrospectively studied the registered medical records (Wells scores and serum D-dimer level) of all patients whose CTPA was requested by their physician with suspicion of PTE. The study was performed in Imam Khomeini educational hospital of Tehran University of Medical Sciences. In this hospital, first the patients were usually visited by residents who are the primary decision makers. Modified Wells score of each patient was determined by a pulmonologist attending physician retrospectively based on registered documents without being aware of CTPA results. Then, the patients were categorized to those with high (likely) clinical probability (score > 4) and low (unlikely) clinical probability (score < 4) of PTE. The CTPA of each patient was performed by fast Sixty-Four detector computed tomography scanner (GENERAL ELECTRIC, Milwaukee, WI, USA). During the imaging procedure, the patient was asked for a single breath-hold. The CTPA acquisition for each patient was performed while he/she lay in the supine position for less than 10 seconds. Scan volume included the entire thoracic cage from the lung apex to its base in the cranio-caudal direction. The detector scan area was 40 mm, the slice thickness was 0.625 mm, and the tube current and voltage were 145 mA and 120 kV, respectively. Visipaque (Amersham Health, Buckinghamshire, UK) was used as contrast medium and injected into the antecubital veins during procedure at a flow rate of 5 mL/s. During a period of six months, of 89 patients who underwent CTPA, seven patients with an unsatisfactory imaging technique were excluded from the study. The mean age was 54.1 years and 46 (56.1%) of the patients were female. In 37 (45.1%) patients, the PTE was likely based on modified Wells criteria. Of these 37 patients, 23 (62.2%) had PTE. On the other hand, when modified Wells criteria was applied to 31 PTE-positive patients, 23 (74.2%) of them were found to have likely pretest probability. CTPA revealed PTE in 31 (37.8%) of the patients, while 16 (19.5%) had a normal diagnosis, 30 (36.6%) had alternative diagnosis, and five (5.6%) had an incidental finding (e.g. pulmonary nodule or lymphadenopathy). Serum D-dimer assay was done in 15 out of 45 (33.3%) patients with an unlikely clinical risk of which nine (60.0%) had positive results, while it was inappropriately checked in 10 of 37 (27.0%) patients with a clinically likely risk of which three had negative D-dimer results. PTE was evident in 23 (62.2%) patients with a clinical likely risk in contrast to eight patients (17.8 %) of unlikely clinical risk. Mean modified Wells score in those with positive CTPA was significantly higher than in those with negative results (6.3 ± 1.6 vs. 2.2 ± 1.3; P value < 0.001). The number of PTE positive cases were significantly higher in the likely risk group versus the unlikely risk group (23 patients vs. 8 patients; P value < 0.001). Six patients in the unlikely clinical risk group had negative D-dimer results and CTPA showed no evidence of PTE in any of them. PTE was evident in two out of three D-dimer negative patients in the likely clinical risk group. General adherence rate to diagnostic algorithm of PTE in those whom CTPA was performed on was 43.9% in our study (33% of CTPA performed for patients of the likely clinical risk group without checking serum D-dimer level and 10.9% of CTPA performed for patients of the unlikely clinical risk group with positive D-dimer level). Despite considerable advances in PTE diagnosis, still there are existing dilemmas in daily practice for physicians. Although PTE is known as a lethal disease, several studies reveal that the increase in CTPA has not resulted in an improvement in patient outcome (2, 3). During a 72-month follow-up of 93 patients with acute PTE isolated to subsegmental arteries without other evidence of deep venous thrombosis, no mortality was reported even in 22 patients who were observed with no therapy (2). Anderson et al. reported PTE overdiagnosis in a study that they randomized 1417 patients with likely clinical probability to receive CTPA or ventilation-perfusion (VQ) scanning as diagnostic imaging modality. Although CTPA detected more PTE than VQ scanning (19.2% versus 14.2%, P = 0.01), there was no significant difference in mortality over a three-month follow up (4). In New York State, during the period when CTPA became the dominant imaging technique for suspected PTE, PTE diagnosis nearly doubled between 1994 and 2004, but the mortality remained unchanged (3). These findings suggest that despite over diagnosis of PTE (diagnosis of clinically insignificant disease) with CT pulmonary angiography, clinically significant disease did not change. In spite of these results and emphasizing on adherence to the existing guideline, there is still excessive unjustified fear of this disease leading to unnecessary extensive work-up including CTPA. 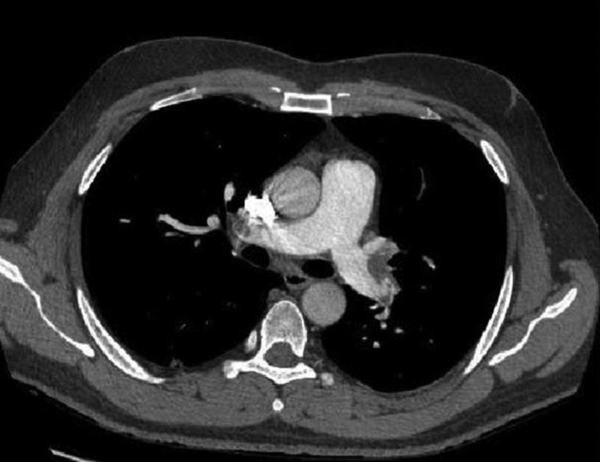 In approaching a patient with suspected PTE, PIOPED II study (Prospective Investigation of Pulmonary Embolism Diagnosis II) recommended assessing clinical probability (measuring Wells score) before the diagnostic imaging plan (5). Therefore, CTPA is not recommended when clinical pretest probability is unlikely and a sensitive D-dimer test result is negative. When clinical pretest probability is likely or a sensitive D-dimer test result is positive in a patient with an unlikely clinical risk, this study recommends performing imaging study. Non adherence to these recommendations and ordering excessive CTPA in a clinical setting exposes the patients to several risks of which overdiagnosis and/or overtreatment is the most serious (5). VQ scanning was introduced in the mid-1960s as the first diagnostic imaging modality for pulmonary embolism (6). Nevertheless, its main disadvantage was inconclusive results. Multi-detector CTPA was introduced in 1998 with higher imaging resolution and more definitive results. Regarding the availability of this modality, there was an explosion in CTPA ordering for patients with suspected PTE. Weiss et al. found CTPA as the first line test ordered by emergency department physicians for approaching PTE (7). According to health maintenance organization reports, performing CTPA was increased to 14-fold (from 0.3 to 4.0 per 1000), while use of VQ scan decreased by 52% (from 2.3 to 1.1 per 1000) from 2001 to 2008 (8). Multi-detector CTPA is now the diagnostic imaging of choice for evaluation of suspected PTE. Sensitivity, specificity, positive predictive value, and negative predictive value was 83%, 96%, 86%, and 95%, respectively in the PIOPED II study which used multi-detector CTPA (4-, 8-, and 16-row) as the diagnostic imaging modality (5). Adams et al. (9) measured loyalty to the PIOPED II recommendations in patients with suspected PTE. They found that the overall rate of pulmonary embolism was 9.7% and more than half of the 3500 (54.5%) CTPAs were performed to investigate PTE in patients who did not have a sufficiently high clinical risk or had a negative D-dimer value. In our study, which was performed in an educational center, 50.6% of the CTPAs were requested for those with a low clinical probability (score ≤ 4). This result highlights the overuse of this costly and potentially harmful mean of diagnosis. On the other hand, three patients in the likely clinical risk group were inappropriately checked for D-dimer. Although the results were negative, CTPA showed PTE in two of them emphasizing that a negative D-dimer result cannot rule out PTE in patients with a likely clinical risk. PTE prevalence among patients included in the multicenter PIOPED II study was 23%, but a study conducted by Costantino et al. suggests that there should be at least a 10% prevalence rate of PTE among those patients undergoing CTPA (10). Overuse of CTPA in diagnosing PTE is not cost-benefit, exposing the patients to false-positive test results, contrast induced nephropathy, and carcinogenic radiation exposure. It is possible to avoid unnecessary imaging requests by more adherence to PIOPED II investigators recommendation (11). This could be achieved with wiser and more accurate clinical risk assessment by more experienced clinicians in the thromboembolic field, especially in the setting of educational hospitals in which the decisions of less trained physicians are influenced by unwarranted fears of disease outcome. To the best of our knowledge, this is the first report that studied the appropriate use of CTPA in an educational hospital. For more comprehensive findings, we recommend larger prospective controlled studies in such hospitals.